If you were to look up the ingredients listed on the label of a moisturizer, you would find that they range from fairly harmless to very toxic. You might think that using a range of cosmetic chemicals on your skin should be fine since they are not actually entering the body. It turns out that anything applied to the surface of the skin enters the bloodstream in under 30 seconds! It’s a common belief that the cosmetics industry and public health agencies are looking out for our best interests. They wouldn’t sell something that isn’t safe, right? In truth, there is very little regulation placed on personal care products. Up until fairly recently, the approach has largely been “innocent until proven guilty” when it comes to the safety of chemicals used in products. Unfortunately, research is now finding that many of the chemicals incorporated into products during the last several decades are dangerous and toxic. If you are hoping to make some healthy adjustments to your lifestyle, it’s a good idea to consider what is in the personal care products you use every day. Vetting products you use on your skin can reduce the amount of potentially toxic chemicals that enter your bloodstream and internal systems. It’s easy to make simple swaps to protect yourself and your family from absorbing a bunch of nasty industrial products. We at The Alternative Daily pride ourselves on supplying you with a steady stream of inspiration for upgrading your medicine cabinet with healthier alternatives. They are often more affordable, too! Mineral oil is an odorless and colorless substance that is made from petroleum jelly. It is found in many different products, such as baby lotion, ointments, hydraulic fluid, wood preservative, pesticides, facial creams and even electrical transformers. Before synthetic oils were invented, mineral oil was used primarily as a lubricant for mechanical parts and machines that require a gliding motion. Nowadays, the mineral oil used in cosmetic products is usually the excess from petrochemical production processes that is scraped from the bottom of the barrel. This doesn’t really sound like something you would want to be smearing onto your face, or your baby’s skin! The Environmental Working Group suggests mineral oil may contain cancer-causing polycyclic aromatic hydrocarbons (PAHs). When used on the skin, mineral oil only keeps the area where it is applied moist, while forming an impenetrable seal that prevents your skin from breathing. Because the skin is the body’s biggest organ, it plays a pivotal role in the removal of toxins. If your skin cannot breathe, it cannot do its job, and your health may suffer as a result. Coating your body in mineral oil is like covering yourself in plastic wrap. In addition, mineral oil attracts moisture from cells deep in the skin, which causes cell renewal to slow and collagen to break down. This in turn damages connective tissue and can cause premature aging. There are over 4,000 published studies that link the use of mineral oil back to negative health conditions. According to the Department of Epidemiology, School of Public Health, University of California, Los Angeles (UCLA), workers in an aerospace manufacturing facility who were exposed on a regular basis to mineral oil, were at an increased risk of developing and/or dying from lung cancer, melanoma and cancers of the esophagus and stomach, along with non-Hodgkin’s lymphoma and leukemia. Clearly this industrial chemical has no place in our homes or on our skin. We encourage you to make an immediate swap to something safer and more natural. Luckily, it’s easy! Nature has provided the perfect alternative for healthy and vibrant skin: pure, extra-virgin coconut oil. Organic coconut oil has been used for thousands of years as an important part of both the medicinal and dietary regimens of traditional island cultures. It is clearly a better option than any petroleum-based product. The wonders of coconut oil taken internally and applied directly to the skin are well documented, with an ever-increasing volume of scientific information extoling its virtues. Not only can coconut oil help reduce abdominal fat and help reduce cravings for unhealthy foods, but it can also act as a moisturizer for all skin types. Several studies point to the ability of coconut oil to heal wounds, treat dermatitis, and serve as a replacement for the antibiotic treatment of acne. Coconut oil also helps to clear away dead skin cells. It can be combined with coconut crystals, sea salt or other natural exfoliating substances to make an effective facial scrub that leaves the skin feeling soft and clean. A simple scrub can be made by mixing one cup of coconut crystals with half a cup of organic coconut oil. No need to spend money on special products when you can use coconut oil! The oil can also be used as a simple makeup remover, since many makeup products are oil-based. Coconut oil does not sting the eyes and helps lubricate the skin for easy removal of makeup. Simply use a cotton swab or facecloth with a little oil to gently cleanse and moisturize at the same time. People living in the tropics have beautiful, wrinkle-free skin — this is due in part to their use of coconut oil. The medium-chain fatty acids in the oil protect and heal the skin from aging and damage. Coconut oil is also an effective sunscreen, blocking out 20 percent of harmful rays. Coconut oil puts nutrients back into your skin, as opposed to mineral oil products that suffocate the skin and provide no nutritional benefit. Coconut oil is an abundant, natural source of lauric acid, which is converted to monolaurin when it enters the body. Monolaurin has an amazing ability to fight unwanted viruses, bacteria, fungi and other microorganisms in a nontoxic way. Therefore the antimicrobial, antibacterial and antifungal properties of coconut oil help protect and balance the skin. Your skin’s surface has a natural microbiome composed of friendly bacteria, which are not harmed by coconut oil. However any pathogenic bacteria, such as candida, are reduced by the use of coconut oil. This might help reduce the incidence of acne. Coconut oil is safe for children of all ages, including babies, and can help heal up a mean diaper rash in no time. Diaper rash frequently results from harmful acids degrading a baby’s skin and encouraging the growth of nasty bacteria. While it’s important to let the baby’s skin dry after it has been cleaned, applying a thin layer of coconut oil afterward is an excellent way to balance the acidity of the skin and neutralize those unfriendly bacteria. If you suffer from acne scars, coconut oil is also abundant in vitamin E, which is an excellent remedy for the healing and smoothing of any past damage. Stretch marks and skin irritations, such as eczema, can also benefit from the nutrients in coconut oil. If you want to use coconut oil as a moisturizer, be sure to start with a very small amount. A little goes a long way, and this makes it an extremely economical choice for a moisturizer. Combine ingredients in a pint-sized or larger glass jar. You can use a mason jar or even reuse a glass jar from pickles, olives or other foods. Fill a medium saucepan with a couple of inches of water and place over a medium heat. Put a lid loosely on the jar and place in the pan with the water. As the water heats, the ingredients in the jar will start to melt. Shake or stir occasionally to incorporate. When all the ingredients are completely melted, pour the mixture into whatever jar or tin you wish to use for storage. Small mason jars (8 ounce) are great for this. Note: The moisturizer will not pump well in a lotion pump. Use this homemade lotion as you would store-bought lotion. It has a longer shelf life than some homemade lotion recipes since all the ingredients are already shelf stable and no water is added. Use within six months to get the best moisturizing benefits. Besides the benefits to skin balance and texture, coconut oil also has a lovely natural scent. The smell will remind you of the beach, or delicious coconut cookies and sweets. Will you trust your skin to coconut oil like the islanders have been doing for thousands of years? We think you will be pleased with the results. Check out this amazing coconut oil face-cleansing method, which helps clear up acne and balances oily skin. Hey Buddy!, I found this information for you: "Why You Should Ditch Mineral Oil and Use Coconut Oil Instead". 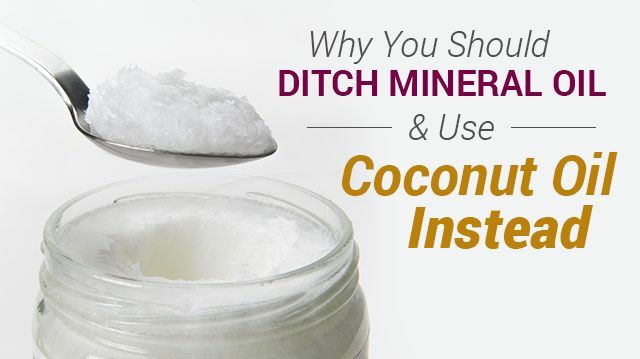 Here is the website link: https://www.thealternativedaily.com/ditch-mineral-oil-for-coconut-oil/. Thank you.